Abrupt climate change melted ice caps and flooded coasts. Regina Shen is an outcast condemned to live on the seaward side of barrier walls. A hurricane threatens to destroy Regina’s world, tearing her from sister, mom, and home. The World Federation’s notorious Department of Antiquities polices barrier walls and suppresses knowledge from the past. Regina thrives on salvage from sunken cities, including illegal print books from before the Federation. With photographic memory, she defies Antiquities by reading books not available in the Federation. Antiquities claims Regina has unique DNA that could single-handedly stop human extinction. It’s too bad she doesn’t trust them enough to barter fairly, let alone with her life. As the storm worsens, Antiquities and their allies doggedly pursue Regina. Does she have the resilience to survive the storm and avoid capture while hunting for family? Global warming has destroyed the ice caps leaving the world sunk in water. In this new world women have taken over and changed all religion to focus around GODs, the Grand Old Dames. The dames are in struggle for who rules the existing world. But in their world, their systems are breaking down. There are no men and the girls created are made in labs. There is a break down in the genetic material and weakened the new children so they don’t survive. Regina Shen is a child in the marshes outside the walls of the country. Thought of as nothing more than swamp rats, the people in this world salvage the old sunken cities for materials to sell. Regina and her mother survive by salvaging. But Regina also has the opportunity of an education with pre-collapsed education. When a hurricane strikes Regina, her mother and her sister try to find higher ground to survive when her mother abandons the girls. Then a Department of Antiquities woman is trying to find Regina and her sister because they may have the genetics to fix the world. Regina and her sister get separated. Regina is racing against time, traps, the Department of Antiquities police and other dangers to try and save her sister and herself from the new flooded world. To purchase Vigilance make sure to visit Amazon, Barnes and Noble, Goodreads and Lance Erlick’s website. 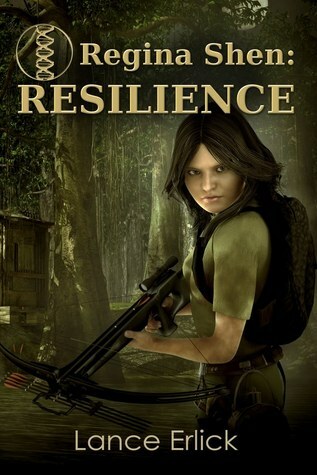 I received Resilience for free from iRead Book Tours in exchange for an honest review. Why did I choose a female protagonist and what got me to think I could pull it off? Growing up, I was surrounded by strong women and often by the absence of men. At one point, I did a one-and-a-half-year stint in a Catholic military boarding school run by Catholic sisters. As a reader, I’ve often experienced getting into various characters’ heads, both male and female. When I was getting ready to write The Rebel Within, I had just finished reading Elizabeth Moon’s The Speed of Dark. She tells the story of a young autistic boy in his point of view. I believe she handled gender quite well, and hopefully I’ve brought lessons from her writing into my work. What helped me over the edge in taking on The Rebel Within was that I’d already written Annabelle Scott as a co-protagonist in Rebels Divided (now the 3rd book in the series). Annabelle got into my head and wouldn’t let go until I wrote her story. I felt I was seeing her world through her eyes and imagined how I/she would deal with what she faced. One thing this series does is play on a reversal of gender dominance with women controlling the society and men discriminated against. Thus, it explores the topic from a different perspective. When it came time to write the Regina Shen series, the answer was obvious. This is a world in which men have become extinct due to events in the story’s past. Naturally, any protagonist I chose would be female. Perhaps I should digress and discuss why I chose a world without men. The idea is an extension of research I did into the Rebel series that hints at future fertility research that could allow two women to have a child without a man. The idea tickled my imagination in the Rebel series where men and women are separated by a shaky peace. I wanted to explore the implications of a society in which there would be no gender issues yet would be consistent with a long history of human nature. By that I mean that we (men and women) are inherently competitive as a species and seek dominance over others in order to secure our place. While some writers have idealized an all-female society, I believe this competition and inherent need for status would perpetuate some institutions even in the absence of men. In any case, it was a fun adventure to create. It’s not heavy-handed in any way, and many readers have found it quite enjoyable. So what I would offer is if you have a story to tell, don’t be scared away by the story’s need to be told by your opposite gender.